Pakistan is now the world's third fastest growing economy among the world's top 25 economies with PPP GDP of over one trillion US dollars, according to the International Monetary Fund (IMF). IMF has recently raised the country's 2018 growth forecast to 5.6%. Spectator Index has ranked India first with 7.3% growth, followed by China (6.5%), Pakistan (5.6%), Indonesia (5.3%) and Turkey (3.7%) among the world's 25 largest economies in terms of PPP GDP. Earlier in October 2017, the International Monetary Fund (IMF) forecast Pakistan's economy to grow at 6.3% CAGR over 2017-2022. The World Bank sees Pakistan's GDP to grow 5.5% in current fiscal year 2017-18 ending in June 2018, a full percentage point faster than the 4.5% average GDP growth for Emerging and Developing Economies (EMDEs) that include Argentina, Brazil, China, India, Nigeria and Russia among others. 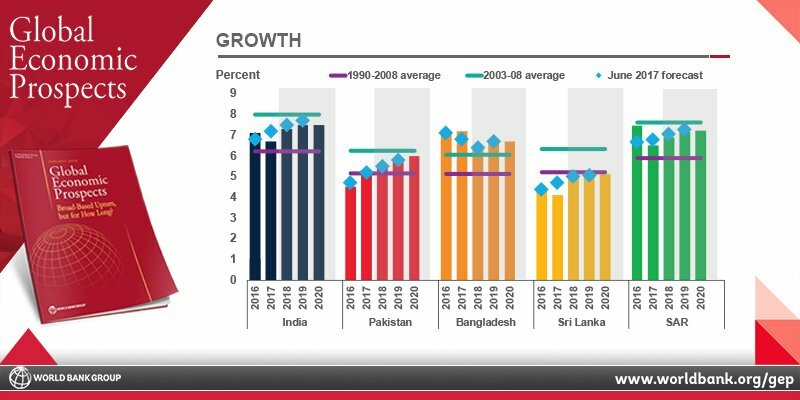 However, Pakistan economic growth continues to lag growth forecast for regional economies of India and Bangladesh. The report also highlights the issue to growing trade deficit and current account gap that could lead to yet another balance of payments crisis for Pakistan requiring another IMF bailout. "In Pakistan, growth continued to accelerate in FY2016/17 (July-June) to 5.3 percent, somewhat below the government’s target of 5.7 percent as industrial sector growth was slower than expected. Activity was strong in construction and services, and there was a recovery in agricultural production with a return of normal monsoon rains. In the first half of FY2017/18, activity has continued to expand, driven by robust domestic demand supported by strong credit growth and investment projects related to the China-Pakistan Economic Corridor. Meanwhile, the current account deficit widened to 4.1 percent of GDP compared to 1.7 percent last year, amid weak exports and buoyant imports." The report correctly points out the problem of growing current account deficit that could turn into a balance of payments crisis unless the trade deficits are brought under control. Recent trends in the last three months do offer some hope with December 2017 exports up 15% while imports increased 10%. Exports in November increased 12.3%. Along with double digit increase in exports in the last two months, Pakistan received remittances amounting to $1.724 billion in December 2017, 8.72% higher compared with $1.585 billion the country received in the same month of the previous year, according to data released by the State Bank of Pakistan (SBP), as reported by Express Tribune. Pakistan is the third fastest growing economy among the top 25 economies in terms of purchasing power parity. Pakistan's economic growth is continuing to accelerate amid rising rising investments led by China-Pakistan Economic Corridor related infrastructure and energy related projects. The IMF sees Pakistan economy growing at 5.6% while the World Bank forecasts it to grow by 5.5% in current fiscal year 2017-18 ending in June 2018, a full percentage point faster than the 4.5% average GDP growth for Emerging and Developing Economies (EMDEs) that include Argentina, Brazil, China, India, Nigeria and Russia among others. However, Pakistan economic growth continues to lag growth forecast for regional economies of India and Bangladesh. The report also calls attention to the expanding current account gap as a matter of concern that must be taken seriously by the government to avoid yet another return to the International Monetary Fund (IMF). Net FDI inflows have fallen this year because of equity divestments by foreign investors. Indians have been fudging GDP for a while. Just need to be aware of its weak fundamental to know it is fakery. "Economists are no better than book-keepers. They often dress up figures to create an illusion of growth. This year’s economic growth figures In India have been very cleverly fudged to create a mirage." Mayraj: " India is not growing faster than China, India;s numbers were fudged from beginning (maybe to encourage investment-but investors have not been fooled)"
M. Ali Kemal and Ahmed Waqar Qasim, economists at Pakistan Institute of Development Economics (PIDE), explored several published different approaches for sizing Pakistan's underground economy and settled on a combination of PSLM (Pakistan Social and Living Standards Measurement) consumption data and mis-invoicing of exports and imports to conclude that the country's "informal economy was 91% of the formal economy in 2007-08". Prominent Indian economists Abhijit V Banerjee, Pranab Bardhan, Rohini Somanathan and TN Srinivasan teaching at MIT, UC Berkeley, Yale University and Delhi School of Economics believe that India's GDP estimate based on household survey (National Sampling Service or NSS) data is about half of what the Indian government officially reports as India's GDP. There is no reason to be happy. Real GDP (Nominal) is what really matters. Areeb:" Real GDP (Nominal) is what really matters"
1. Service sector accounts for significantly more than half of GDP in most major economies in top 25 today. For example, service sector contributes 53% of Pakistan GDP, 57% of Indian GDP, 77% of US GDP, etc. Service GDP includes things like haircuts, education, health care and retail where wages differ widely for the same or similar work. For example, a haircut in Pakistan costs a fraction of what it costs in America and Europe but it has the same value. 2. Most of the economic transactions are domestic. Exchange rate is important in trade which makes up less than 50% of the total GDP of most major economies. Trade to GDP ratio for Pakistan is just 25%. India's is 40%. US's is 27%. China's growth is undeniable.It invests in its people. Indians don't, so I have never believed the hype about India. China is very proactive, the sign of a successful country is how proactive it is. OBOR came as western economies declined. Since West is aging consumption is bound to decline. OBOR is linking China to countries with young countries;and giving those countries an infrastructure boost. Mayraj: "China's growth is undeniable.It invests in its people. Indians don't, so I have never believed the hype about India." Hold your elephants. The Indian middle class conjured up by the marketers and consultants scarcely exists. Firms peddling anything much beyond soap, matches and phone-credit are targeting a minuscule slice of the population (see article). The top 1% of Indian adults, a rich enclave of 8m inhabitants making at least $20,000 a year, equates to roughly Hong Kong in terms of population and average income. The next 9% is akin to central Europe, in the middle of the global wealth pack. The next 40% of India’s population neatly mirrors its combined South Asian poor neighbours, Bangladesh and Pakistan. The remaining half-billion or so are on a par with the most destitute bits of Africa. To be sure, global companies take the markets of central Europe seriously. Plenty of fortunes have been made there. But they are no China. Worse, the chances of India developing a middle class to match the Middle Kingdom’s are being throttled by growing inequality. The top 1% of earners pocketed nearly a third of all the extra income generated by economic growth between 1980 and 2014, according to new research from economists including Thomas Piketty. The well-off are ten times richer now than in 1980; those at the median have not even doubled their income. India has done a good job at getting those earning below $2 a day (at purchasing-power parity) to $3, but it has not matched other countries’ records in getting those on $3 a day to earning $5, those at $5 a day to $10, and so on. Middle earners in countries at India’s stage of development usually take more of the gains from growth. Eight in ten Indians cite inequality as a big problem, on a par with corruption. The reasons for this failure are not mysterious. Decades of statist intervention meant that when a measure of liberalisation came in the early 1990s, only a few were able to benefit. The workforce is woefully unproductive—no surprise given the abysmal state of India’s education system, which churns out millions of adults equipped only for menial work. Its graduates go on to toil in small or micro-enterprises, operating informally; these “employ” 93% of all Indians. The great swell of middle-class jobs that China created as it became the workshop to the world is not to be found in India, because turning small businesses into productive large ones is made nigh-on impossible by bureaucracy. The fact that barely a quarter of women work—a share that has seen a precipitous decline in the past decade—only makes matters worse. Good policy can do an enormous amount to improve prospects. However, hope should be tempered by realism. India is blessed with a deeply entrenched democratic system, but that is no shield against poor decisions. The sudden and brutal “demonetisation” of the economy in 2016 was meant to target fat cats, but ended up hurting everybody. And the path to prosperity walked by China, where manufacturing produced the jobs that pushed up incomes, is narrowing as automation limits opportunities for factory work. All of which means that companies need to deal with the India that exists today rather than the one they wish to emerge. A strategy of waiting for Indians to develop a taste for products that the global middle class indulges in—cars as income per head crosses one threshold, foreign holidays when it crosses the next—may lead to decades of frustration. Only 3% of Indians have ever been on an aeroplane; only one in 45 owns a car or lorry. If nearly 300m Indians count as “middle class”, as HSBC has proclaimed, some of them make around $3 a day. Very soon, it will overtake arch rival India and be head to head with staunch ally China. Ahmad: "Very soon, it will overtake arch rival India and be head to head with staunch ally China." I am very optimistic about Pakistan's future. It will be among the biggest and most powerful economies in the next few decades. I believe 135 million strong Pakistani millennials will change everything. India is growing faster than China? Riaz Bhai, do you agree with this data on India? Faraz: "India is growing faster than China? Riaz Bhai, do you agree with this data on India?" Riaz, I am surprise that an analyst like you is endorsing this unrealistically optimistic projection. It is clearly over the top. Impossible to comprehend. Very difficult to take seriously. What has been the track record of these people's projections? What were they saying about Pakistan ten years ago? Or twenty years ago? Did they foresee the breakup of East Pakistan? Did they foresee four bouts of military rule? We have all been there, going back to the early 1960s when Pakistan was poised to take-off and speed past all the countries of Asia. It did not happen.. The best we have is a book by a leading economist that lays out, with some trepidation, a scenario in which Pakistan will become an Asian Tiger by 2050. So what does one say about this ultra-optimistic projection, driven by retail sales no less. I am sorry to say but it is clothed in naiveté of the kind never seen before. It should be given a model for breaking ground. It will take more than 135 million millennials to move Pakistan forward. The write-up totally ignores Pakistan's domestic and international fault lines. It ignores the long history of conflict with India and the saber-rattling that continues in Kashmir and which has now escalated into a discussion of a nuclear exchange between senior army generals on both sides. It ignores the mess that exists in Afghanistan and the threat posed by the Taliban, ISIS and Al-Qaeda. Furthermore, it ignores the tussle going on in the country between the elected government, other political parties, and the army. Finally, there is the internal struggle to define "who is a good Muslim" and therefore "a good Pakistani." And minor issues like riots, lynchings and enforcement of the Blasphemy Law. The social, cultural and political problems which beset the country cannot be wished away. If all those could be wished away, Pakistan may live up to those projections of rapid growth. Otherwise all we have is Pollyanna's view of the future. 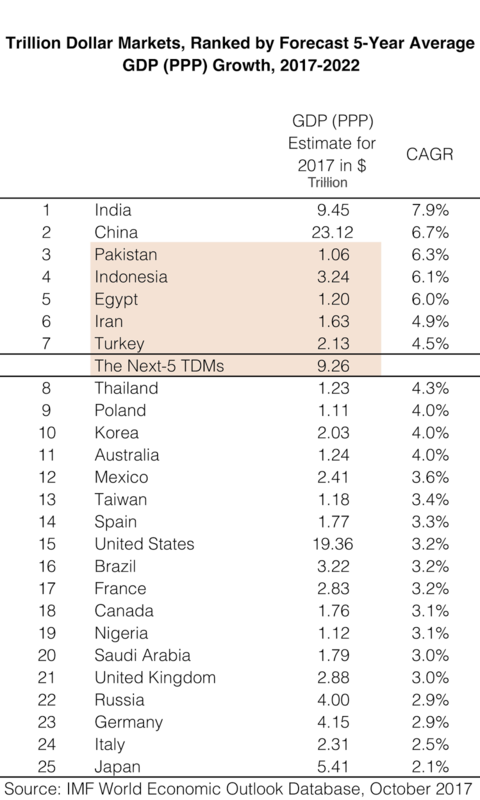 In the other table you sent around of the trillion dollar markets, Pakistan's growth rate shows up at 6.3%, the third highest. Well, it would be good to add a variance or standard deviation next to it. If you divide the mean by the standard deviation, you get the coefficient of variation. In Pakistan's case, it is going to be really high, making forecasts very risky. Ahmad: " I am surprise that an analyst like you is endorsing this unrealistically optimistic projection. It is clearly over the top. Impossible to comprehend. Very difficult to take seriously." I am not being unrealistic. Pakistan has defied and continues to defy all "realistic"doomsayers. Pakistan economy has substantially grown over the last decade in spite of all its problems that have made big headlines and continue to make big headlines. 135 million young Pakistanis are much better educated and far more ambitious than their parents' generation. And Pakistan offers much greater upward mobility than India and China and other major economies. Number game looks good! But why most if not everyone ignore debt situation of Pakistan? Anwar: "Number game looks good! But why most if not everyone ignore debt situation of Pakistan?" Pakistan's debt-to-gdp ratio is about 60% which ranks it at 73 in the world, according to CIA Factbook. India's debt-to-gdp ratio is about 50%, ranking it at 97. 72 countries, including US, Japan and most of Europe, have higher debt-to-gdp ratios than Pakistan's. You know there are parallels between India and UK. Common feature is India suffers from culture of extraction oprientation British left behind. But British also affected by it. Got so used to extractive orientation didn't lnow how to invest in own capacity building, so Germans left them in dust from 19th century! The British never recoovered. Their fall back position was reliance on speculative/ rent seeking finance, as just did nopt have the muscle to do more.In US, southern states are also like this. Their extractive orientation also colonial legacy;and were unable to shake it all the way to the present! No dominance of finance in US has made extraction orientation (rent seeking) the norm. Really sad how US is cratering from within because of this. Check out Stigler Center's ProMarket blog. KARACHI: Sales of passenger cars rose 20.4 to 103,432 units in the first half of the current fiscal year of 2017/18, official data showed on Wednesday. Car sales stood at 85,901 in the same period of last fiscal year, according to Pakistan Automotive Manufacturers Association (PAMA). In December 2017, sale of cars fell to 16,159 units as against 17,233 units in the previous month and 14,024 units in the same month a year ago. Topline Securities, in a report, said the decline was due to the year-end’s leaner period of auto sales. A total of 47,087 cars of 1,300cc or above category were sold during the first half, up 5.92 percent over the same period a year earlier. But, the sale in the category declined to 6,652 units in December 2017 as against 8,087 in November and 6,880 units in December 2016. Arslan Hanif, an analyst at Arif Habib Limited attributed the decline to crackdown of Indus Motor Company and cancellation of pre-booked orders of cars due to excess premium charged by dealers. Under the category of 1,000cc category, a total of 23,642 units of Suzuki Cultus and Suzuki WagonR were sold, up 61 percent against 14,669 units sold last year. One analyst said there is a huge increase in 1,000cc cars, as both WagonR and new variant of Cultus saw an amazing success in the country during the period under review. Dispatch of 1,000cc category cars exhibited an uptick due to a massive demand from Careem, Uber and other transportation businesses. Sales of 800cc and below 1,000cc cars, Suzuki Mehran and Bolan, increased 22 percent to 32,703 units in July-December from 26,780 units in the corresponding period last year. “We believe Pak Suzuki continued to be major beneficiary as majority of used-car imports fall under lower engine capacity segment,” Topline Securities added. A total of 4,562 buses and trucks were sold in the six-month period, up 17.5 percent. Sales of farm tractors grew 54.3 percent to 32,310 units during the period under review. A total of 6,797 jeeps were sold during the July-December period, depicting manifold growth as compared to 205 units sold during the same period last year. The hefty sales were visibly due to an introduction of Honda’s BR-V. Honda recorded sales of 5,159 units of its new edition during the first half. Sale of pick-ups was recorded at 13,909 units during the six months as against 11,427 units sold in the corresponding period last year. Pakistan Automotive Manufacturers Association data further showed that a total of 940,825 motorcycles and three-wheelers were sold during the period under review, up a 19 percent over the same period a year ago. KARACHI: Motorcycles production in Pakistan is reaching to its highest level with 2.3 million quantity of produced during the ten months of 2017 while average 7,408 new motorcycles hit roads daily in the country. The production of motorcycles increased by 22.34 percent during the first four months of fiscal year 2017-18 (FY18), as compared to the corresponding period of last year, latest data of Pakistan Bureau of Statistics (PBS) revealed. PBS’s latest data reveals that the motorcycle production including locally assembled Japanese brand and Chinese made imported motorcycles’ brand stood at 2251917 units in the first ten months (January-October) of 2017. It is to be noted that at least 2.5 million motorcycles were manufactured during past year while the number of motorcycles’ production in Pakistan has already crossed the 2 million mark in just ten months of this year. It has been observed that in the absence of any public transport system in Pakistan, lower middle-income class of the country has been compelled to compromise their safety by choosing the two-wheelers as their conveyance. Muhammad Zahid Iqbal Malik of Pakistan Bikers Club (PBC) said motorcycle assemblers in Pakistan produce low quality products just to maintain price stability. He said steady prices besides easy installment plans are the main reasons behind rapid growth of two wheelers in Pakistan. He said rapid motorcycle production in Pakistan apparently portrays brighter picture but it is a harsh reality that among 2 millions motorcycles produced in 2017 we didn’t manufacture even a single bike here with 100% Pakistani parts. “It is true that motorcycle industry is booming and providing opportunities for locals and supporting the economy. But Pakistan is still far behind from its neighbouring country as Indian company Hero started manufacturing with Honda Japan and now it has become a separate entity bigger than Honda”, he added. Association of Pakistan Motorcycle Assemblers (APMA) Chairman Mohammad Sabir Shaikh said globally, there is an average life of a motorcycle, but in Pakistan with the nonexistence of any such law, the tax departments are allowed to collect lifetime tax at the time of registration of a new bike. He further added that the situation is really alarming as the authorities don’t follow any standards for motorcycles’ registration which is making the motorcycle as the leading cause of fatalities. He was off the view that the government should set the effective life limit of a motor cycle for tax reasons since the tax offices use 100 years as their average life at present. He suggests that the tax authorities should register a motorbike only for five years and after that period the registration of the motorbikes should be subjected to fitness tests. Pakistan: Cement sales rose by 12% year-on-year to 22.2Mt in the last six months of 2017 from 19.8Mt in the same period in 2016. Data from the All Pakistan Cement Manufacturers' Association (APCMA) shows that domestic consumption rose by 17.4 % to 19.8Mt from 16.9Mt, according to the Express Tribune newspaper. However, exports continued to decline in the period by 17.3% to 2.9Mt from 2.4Mt. Exports fell in most parts of the country, particularly in the south, despite increases from plants in Punjab and Khyber-Pakhtunkhwa. The APCMA has blamed this on high industry costs, foreign imports and local legislation. SURAT, India — The immense popularity of Narendra Modi, India’s most dynamic prime minister in decades, has always rested on two legs: Hindu nationalism and his tantalizing promises to build on the country’s go-go economy. That second leg is now looking a little shaky. In the last two years, India’s consumer confidence has plummeted, construction has slowed, the fixed investment rate has fallen, many factories have shut down and unemployment has gone up. Fingers are pointing at Mr Modi. Just about all economists agree that two of the prime minister’s biggest policy gambles - abruptly voiding most of the nation’s currency and then, less than a year later, imposing a sweeping new sales tax - have slowed India’s meteoric growth. “Things have been worsening, worsening, worsening,” said Himanshu, an economics professor at Jawaharlal Nehru University in New Delhi, who uses only one name. Still, the economy here is far from failing. The stock market continues to soar, major rail, road and port projects are unfolding across the country, and foreign investors poured US$25.4 billion (S$33.8 billion) into India from April to September, up 17 per cent from the period in 2016. The government on Friday predicted that the country’s gross domestic product would grow by 6.5 per cent in the 2017-18 financial year. While that is the lowest number the country has seen in four years, India’s economy is one that most countries would love to have. But it does not feel that way to the huge number of Indians negatively affected by Mr Modi’s policies, and the grumbles are growing. So are social tensions, especially those that divide Hindus from Muslims, and upper caste from lower caste. The fear is that Mr Modi is already beginning to lean more heavily on that first leg of his, Hindu nationalism, now that his economic strategy is losing some of its sheen. With 1.3 billion people, India is the world’s most populous democracy. In 10 years, economic forecasters predict that India’s economy will climb to third-largest in the world, behind only the United States and China. What happens here matters, and domestically, confidence is strained. Even in Gujarat, the state considered the strongest of Mr Modi’s strongholds, where people have been cheering his rise for the past 20 years and line up in dusty fields by the thousands just to catch a glimpse of his saffron scarf and groomed white beard, many feel betrayed. The output from the textile industry, a huge employer here in Surat, a Gujarati metropolis with hundreds of years of storied mercantile history and once a healthy exporter, has been cut nearly in half, prompting layoffs and despair. In many of the industrial areas, the happiest merchants are the merchants of scrap, who make their rounds in lurching trucks, scooping up looms, steel spools and other underused machinery for pennies on the dollar. In December, in an election that the entire country was watching because it was seen as a referendum on Mr Modi’s governance, Gujarati voters elected a new state Assembly. Mr Modi’s party maintained its majority but lost 16 seats. The message was clear: Mr Modi’s party was still No. 1, but the man himself was no longer bulletproof. “Modi hurt our business, and we want to show him that we can hurt him, too,” said Manish Patel, whose once clackety cloth factory is now completely empty, another Gujarati business that has gone under. KARACHI -- Terrorism, corruption, misrule: Negative perceptions have dogged Pakistan for years. But thanks to sweeping operations by the army and a powerful paramilitary force, those perceptions may be becoming outdated, and businesses are taking notice. In Karachi, the country's largest city, motorcycles and elaborately decorated buses weave down dusty roads between colonial-era buildings. Less than a decade ago, these were truly mean streets. "Between 2010 and 2012, we saw one or two terrorist attacks every month and one or two targeted killings and kidnappings for ransom every day," recalled Army Maj. Gen. Mohammad Saeed. "There were 17 no-go areas which the police could not touch in Karachi." At the time, even major hotels had occupancy rates of just 10% to 15%. Hundreds of shops and other businesses closed down. Then the Rangers began to clean up. The Pakistan Rangers, a paramilitary law enforcement organization overseen by the military and the Interior Ministry, set out to tackle the violence head-on. In 2013, the Rangers Sindh -- which operate in Sindh Province, including Karachi -- mobilized 15,000 troops. The provincial legislature granted them broad powers to search homes and make arrests, enabling them to quickly turn the tide. In 2017, there were zero bombings and only five kidnappings, according to Saeed, who serves as director general of the Rangers Sindh. This is no small feat in a city with a swelling population of 17 million -- perhaps even 20 million if migrants from rural areas are factored in. "We destroyed all of the terrorists' pockets," he said, adding that hotel occupancy rates are over 90%. The story is similar in Pakistan's other major cities. And as the Rangers have made headway, business sentiment has improved and growth has picked up. Pakistan's real gross domestic product grew 5.3% in the fiscal year through June 2017, the quickest pace in 10 years. The central bank projects the growth rate for this fiscal year will approach 6%. Inflation has stabilized and exports are brisk. "Unfortunately, Pakistan is a victim of negative perception," said Arif Habib, who heads the conglomerate Arif Habib Group. "There is a lot of difference between perception and reality." But the rest of the world seems to be catching on to the positive changes, too: Foreign direct investment is estimated to reach a record $5 billion or so in the current fiscal year, up from $3.43 billion last year. Last June, in a survey by the Overseas Investors Chamber of Commerce & Industry, 89% of respondents said security concerns in Karachi had receded since 2013. The OICCI is made up of 193 companies, mainly major foreign businesses in Pakistan. Each year, it surveys the members about factors that are hampering investment in Pakistan. "The top answer in 2015 was 'security, law and order,' but it fell to third place in 2017," said OICCI Secretary-General Abdul Aleem, who served as the chief executive of a state-run company. "It was overtaken by 'tax burden' and 'policy implementation.'" KARACHI: The State Bank of Pakistan (SBP) Friday said the preliminary data on key macroeconomic indicators suggest that growth momentum remained in the first quarter of the current fiscal year. The Central Bank mentioned in its first quarterly report for FY18 that several coincident indicators point to a further strengthening of aggregate supply and demand in the economy. According to the report, with the exception of cotton, other major kharif crops achieved or surpassed the FY18 targets. This improvement is supported by sufficient water availability, healthy fertilizer off take and an encouraging increase in agricultural credit disbursements. The large-scale manufacturing also experienced a 10 percent high growth during Q1-FY18 – the highest quarterly growth since FY09. The performance was encouraging as all sectors, barring fertilizer, contributed positively. This broad based\ growth can be attributed to better energy availability, improved security situation, and rising consumer demand on the back of higher purchasing power and access to affordable credit facilities. The healthy performance of commodity producing sectors had a positive impact on the services sector as well, it added. The Report highlighted that timely policy support, favorable cyclical movements, low and stable inflation along with growing confidence triggered an uptick in the private sector credit. In particular, the fixed investment loans expanded for the twelfth consecutive quarter in Q1-FY18. The Report also observed the noteworthy rebound in FBR revenues on the back of increased economic activity. New infrastructure projects, surge in imports, higher consumption of consumer durables, and increased prices and consumption of POL products significantly contributed to both direct and indirect taxes. Notwithstanding this performance, the Report emphasized on the need for more concerted efforts aimed at expanding the tax base. It also highlighted that the recent significant gains in export growth and foreign direct investment are welcome developments. However, these gains were not enough to contain the overall balance of payments deficit. On the back of an expanding economy, import payments far exceeded the aforementioned positives and the external sector remained under pressure. The widening of current account deficit along with an increase in economic activity is a recurring phenomenon for Pakistan, and one that has the tendency of disrupting growth cycles. There is, hence, an urgent need to find innovative policy mixes, avenues for raising foreign exchange earnings, and realigning policies favoring export growth. In brief, the first quarter developments show that Pakistan’s economy is well poised to continue on its growth momentum for FY18. However, in order to maintain this virtuous equilibrium of high growth and low inflation in the medium- and long-term, the Report underlines the need to address long-standing structural reforms in the fiscal and external sectors. I would take statistics of India with a grain of salt because indian economy much dependent on oil prices.when ever oil price is low it performs better. Remember in 2012 when oil is $125/barrel fareed zakaria was complaining abt indian economy and want to replace India with Indonesia in BRICS. about Pakistan being third fastest growing economy, the 3rd column (GDP) should be Trillions, $ not Billions $. Also, this is a projection estimate for 2017-2022. That means Pakistan is expected to be the third fastest growing economy. The surprise is Turkey, which is currently doing fine, but for some reason the projection is dim. Rashid: "about Pakistan being third fastest growing economy, the 3rd column (GDP) should be Trillions, $ not Billions $." Good catch. It should be trillion, not billion. At 5.6% growth in current FY 2017-18, Pakistan IS the 3rd fastest growing among top 25 economies today. he State Bank of Pakistan (SBP) said yesterday that prospects for economic growth remain strong, noting that the economy is poised to achieve the growth target of 6% for 2017-18. In its first quarterly report on the state of the economy, the SBP said rising income levels of consumers are fuelling retail sales and commercial activities. However, there was an urgent need for finding more avenues for foreign exchange earnings and realigning policies favouring exports growth by addressing long-term structural impediments. “For the external sector, recent gains in exports growth and foreign direct investments (FDI) while significant were not enough to contain the overall balance-of-payments deficit,” said the report. It added that the widening of the current account deficit associated with increased economic activity is a recurrent phenomenon in Pakistan and has undermined maturing growth cycles in the past. While the report expressed satisfaction over the increased revenue in the first quarter of 2017-18, it said that earlier efforts aimed at increasing the tax base need to be more concerted and perhaps require new, innovative methods. The report raised the question whether the economy is doing well enough to sustain the virtuous equilibrium of high growth-low inflation into the medium and long terms. The report stressed the need for addressing the long-standing structural reforms in the fiscal and the external sectors for sustainability. The report analysed the recent growth in exports and identified three reasons for it. Uninterrupted energy supplies to the manufacturing sector, increasing global demand and commodity prices and the recent exchange rate deprecation. What stands out is the role of a benign inflationary environment for some time now that has helped spur the expansion in economic activities. Low and stable prices have facilitated and eased the process of economic decision-making. “More tangibly, falling inflation along with healthy agriculture output and stable exchange rate has resulted in higher real rural incomes and urban wages. The resultant boost in consumption forms an integral part of the current economic growth paradigm,” said the report. Low inflation has also allowed the SBP to cumulatively cut the policy rate by 425 basis points since the autumn of 2014. The report suggested that average inflation in 2017-18 would remain below its annual target of 6%. However, there are two major risks to this inflation forecast: first, recent exchange rate depreciation through expectations channel and, after some lag, through the higher imported goods’ price can seep into domestic prices; second, uncertain global oil prices pose both upside and downside risks. The report said in the first quarter, the fiscal deficit was 1.2% of gross domestic product, lower than 1.4% recorded in the corresponding period of the last year. Total revenue recovered strongly, showing an 18.9% increase in the three-month period against an 8% decline in the same period a year ago. “Against this, consolidated federal and provincial expenditures grew 12.8% compared to 2.8% increase in the same period last year,” said the report. A worker inspects fabric on looms at a textile manufacturing unit in Karachi. The State Bank of Pakistan said yesterday that prospects for economic growth remain strong in Pakistan, noting that the economy is poised to achieve the growth target of 6% for 2017-18. Finance minister Ishaq Dar said in June 2017 that Pakistan's nominal GDP is heavily under-reported, its under-reported by 20-25% and he is working now in consultation with WB, IMF to rebase GDP. Pakistan is still using nearly 20 year old consumer prices to evaluate its current GDP. I am expecting that finance ministry should complete the rebasing and revision for previous years by June 2018. Lets see if its done this year by present govt. 91% informal economy as per M. Ali Kemal and Ahmed Waqar Qasim, economists at Pakistan Institute of Development Economics (PIDE) will still be there after rebasing, but might be near 70%, unless each and every transaction is digitised. Rising credit off-take of commercial banks indicates a significant growth of the economy, while a major campaign has been launched to ensure a fast track service for home remittances. This is confirmed in the Banks Lending Survey (BLS) just unveiled by State Bank of Pakistan (SBP), the central bank. The survey conducted during second quarter of financial year 2017-18. SBP's 'good-business' report said after receiving the feedback from senior bankers of 18 banks, the central bank identifies two main factors supporting the expansion in the credit demand. These factors include 'the need of firms for building up their inventories and working capital' and 'improved economic conditions'. "Increase in fixed investment and seasonal increase in credit demand are two other factors," it further said. The overseas Pakistanis sent home $11.4 billion remittances during the first 7 months of 2017-18, the SBP reported. The inflow was 3.55 per cent higher than the like period of 2016-17. The SBP data showed that the inflow was significantly high from US, UK and EU. The remittances from Saudi Arabia at $2.914 billion were the highest, followed by the UAE with $2.512 billion and rest of the GCC countries with $1.314 billion. The remittances from UK totalled $1.585 billion followed by US $1.504 billion and EU $371 million. In order to help the overseas Pakistani and their families back home, the government of Pakistan and the Sate Bank of Pakistan are pushing the commercial banks to reduce their handling charges to encourage the remittances inflow. "We are urging all the commercial banks to improve their system for timely payments of remittances into the accounts of recipients," said Jamil Ahmed, deputy governor of SBP. "We are doing our best to encourage the overseas Pakistanis so that they can transfer their money through official channels instead of 'hundi' and 'hawala'," he added. Jamil made these remarks at the launch of a documentary film called 'hundi to kundi lagao' (Lock up the hundi), prepared by National Bank of Pakistan. It was a part of the bank's awareness campaign to encourage overseas Pakistanis to use official banking channels for remittances. Jamil advised the bankers to use social media for marketing services. He said the amount sent by overseas Pakistanis through official channels rose 16 per cent between 2009 and 2017, making Pakistan. It is indeed heartening to note that the focused efforts of all stakeholders resulted in an increase of 13.2 per cent during the first two months of 2017-18 as against a fall of 3.1 per cent in 2016-17. "Now there is a need to maintain this momentum and a positive growth trajectory in the coming months," he said, adding that the "focused area of inflow of remittances are the UAE, Saudi Arabia and other Gulf countries, which contribute 87 per cent to the remittances we receive." Seed Ahmed, president of National Bank of Pakistan, speaking on the occasion said Pakistan is facing the challenge of balance of payment deficit and to meet this challenge the remittances play an important role. "Inflow of remittances can be much improved if banks adopt the system of the fastest payment of remittances to the recipients," he said, adding that the idea behind making this movie is to urge the people that whatever money is coming into Pakistan, it should be routed through legal channels. "Banks will serve the customers with an exceptional efficiency." The banking industry is now doing its utmost to help the overseas Pakistanis with transfer of their remittances through fast track legal channels. That is a good news.